Hi there! I loved my last underwater mani so much that I did another one. This time I thought I’d use my newest glitter polish – which reminded me very much of mermaids – and my Sugar Bubbles SB 031 stamping plate. Rimmel 60 Seconds 844 Out Of The Blue (base colour, pinky). Beauty UK White (base colour, ring and middle fingers). Astor Lacque Deluxe 880 Forest Green (base colour, index finger and thumb). Essence Nail Art Stampy Polish in White (stamped image on pinky, index finger, thumb). 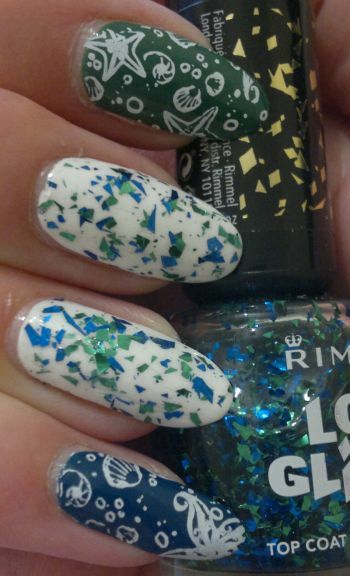 Rimmel Love Glitter 034 A Crush On You (glitter topper ring and middle fingers). So here it is – my underwater mani! I think it turned out great. What do you think? Hi there! Today’s post is about the mani I did the other day. I got myself a few new stamping plates – with one of them being MoYou London’s Doodles 07 plate. 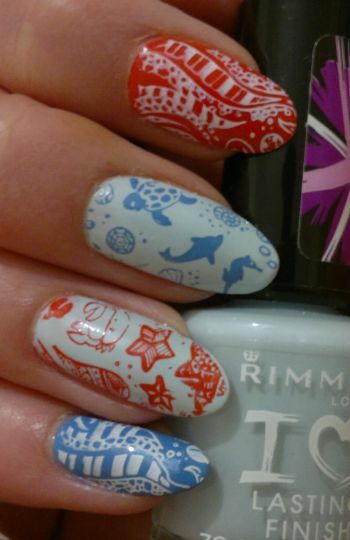 So I thought I’d do a colourful (blue, white, orange) underwater mani! Orly Snow Cone (base colour pinky and thumb, stamped image middle finger). Revlon Red Bikini (stamped image ring finger). Ciaté Hopscotch (base colour index finger). Rimmel I ♥ Lasting Finish 704 Sweet As Sugar (base colour middle and ring fingers). The amazing Essence Nail Art Stampy Polish in White (stamped image index finger, thumb and pinky). I really love how this mani turned out. And I have a few more ideas on what to do with this stamping plate. 🙂 A note to myself: Orly Snow Cone and Revlon Red Bikini stamped really well!